Director of the State Assets Recovery Agency (SARA), Professor Clive Thomas on Friday said information provided by several foreign agencies was being converted into evidence to build solid cases to recover cash and other properties locally and overseas. “That’s what we are doing most of the time. 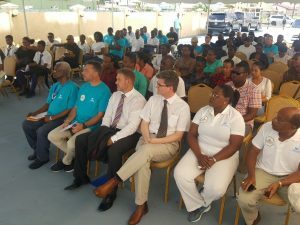 That’s what make the cases long- have to convert the information into evidence…That’s what we are trying to do because we are hoping to take some of the cases to court by the third quarter of this year,” he told Demerara Waves Online News. No prominent member of Guyana’s private sector or junior members of the opposition was seen at the event. Thomas said about eight to 10 cases could form part of the first batch of “strong” cases to be filed for civil recovery of state assets in keeping with the United Nations Convention on Corruption. He stressed that it was important for the evidence to meet the standards of foreign courts where some of the cases would be filed. “They will not all be taking place in Guyana…They will be taking place in Guyana ultimately but not all of them will be initiated locally,” the SARA Director added. In addressing participants before they proceeded on the anti-corruption walk that recovering lot of the wealth that is stashed overseas requires international help. “We can’t recover state property in this country, believe you me, without fighting in the courts outside of Guyana so the fight that we engage in here is not a national fight. It’s a global fight! The wealth has left Guyana. It is deposited into accounts in places outside of Guyana and we have to find the means and the support that we need to get to those accounts to place the charges against the persons who hold Guyanese assets through some initial unlawful conduct and to try to recover it for Guyana,” he said. He said documents from external law enforcement agencies such International Police (InterPol), United States’ Homeland Security and the Caribbean Financial Action Task Force showing “the massive scale of corruption and money laundering” during the late 2000s to mid 2010″ did not contain hard evidence to make out strong court cases. “The standards that they seek are the standards of those organisations for the publication of data, not our standards. Our standards are going to be based on evidence that can be taken to a court and there is a difference between information and evidence so our task is to convert whatever information we get into evidence,” Professor Thomas told Demerara Waves Online News. He said the “documents” to which he referred in his letter to Opposition Chief Whip, Gail Teixeira could be related to as evidence “but you have to put them in an evidentiary form” “Just publishing information like that is not enough fr the court. There are precise rules on how evidence is prepared and handled in the court and we have to meet those standards,” he added. The SARA Director said many of Guyana’s state assets recovery cases would have to also meet the standards of international courts. 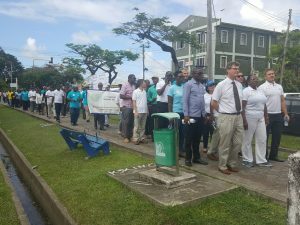 British High Commissioner to Guyana, Greg Quinn remarked before the start of a SARA-organised anti-corruption walk along Camp Street, that “it is relevant to note that progress being made here in Guyana” to fight corruption based on Transparency International’s Corruption Perception Index. In his increasingly hard-hitting anti-corruption posture, the United Kingdom envoy said no one was exempt from punishment and whistle-blowers must be protected. “There can be no escape and no impunity for those who are corrupt. Regardless of where you are, regardless of who you are, everyone must act within and be subject to the laws of the land,” he said. Quinn said there was need to boost public confidence in the law enforcement system so that when complaints of corruption are made that “they will be taken seriously and that action will be taken so proper reporting systems need to be put in place as well as systems to protect those who report wrong-doing”. At the same time, Quinn said progress was slow because the score on the perception index was below 50, an indication that there were still problems. “Things are getting better but they are getting better slowly and it’s important to note that a score below fifty indicates problems with corruption so let’s not think that this is not an issue,” he said.